According to Kurt Vonnegut, in his new book of essays (essays, BTW, are what people used as blather-platforms before there were blogs), the first rule in creative writing is, Do not use semi-colons. I'm abashed to admit I'm secretly fond of them, though I do go back and get rid of two out of every three ones I put in; now I suppose I'll have to go over my entire oeuvre with a fine-toothed colon comb and flush each last one of them out. I'd do that for Kurt, because I love the man. How can you not love a writer who says he's suing the manufacturers of his cigarettes for a billion bucks because they've promised to kill him (see the small print on a package of Pall Malls) and he's still very much alive? To me Vonnegut seems one of the last contemporary writer guys to fulfill the romantic figure of what a writer is supposed to be -- original, audacious, inspiring. That he is on the bestseller lists, at 82 (after having semi-officially retired from writing books some years ago, no less), is a cause for celebration and a renewal of hope: if he's selling that many books at this moment in America, maybe we're not as stupid as we've seemed to be. One of the neat things about reading a Kurt Vonnegut book is that he tends to use a lot of very short paragraphs. Look at all this white space! Isn't it nice? He writes fiction that looks as sparse as good screenwriting (though the screen has not been as good to his works as it should). In his work, he seems particularly attuned to how what seems to be junk can actually be significant, and vice versa, and to how the most seemingly mundane, momentary interactions can turn human beings into the playthings of enormous forces. Despite all of my run-ins with celebrities, I would never have dreamed of going up to a famous person in a public place (i.e. a non-performance environment) and asking for an autograph. The concept has no appeal. But when my dear friend Darcy Hawes (wife of esteemed painter-bassist Jimi Hawes and mother of Dexter Hawes -- recipient of one of the best names ever given to a non-fiction character) found out that Kurt Vonnegut lived across the street from my parents and got all excited, saying that he was her favorite writer, and if she could have his autograph she'd be ecstatic, I told her I would see what I could do. It was one of those things one says that's just an expression of good intentions, because although Vonnegut's townhouse is indeed located diagonally across from my parent's apartment building in Manhattan, I'd never encountered the man in person, not in all the years they'd lived there, and didn't expect to, anytime soon. A month or so later I flew back to New York on business and stayed with my folks for a few days, and get this: one morning as my dad and I left his block and turned north on Second Avenue, here came Kurt Vonnegut, headed home. Kurt looked more like a writer than any other writer I've ever seen. He was wearing a worn cardigan and corduroys, his hair was disheveled and mustache droopy, his eyes behind silver-framed spectacles seemed fixed on something miles away, and there was a cigarette hanging from his lower lip that looked glued there, defying gravity. If one can imagine New York City as a kind of giant industrial farm, then he looked like one over-worked farm animal. Slightly stooped, with his hands shoved deep in his cardigan pockets, he didn't so much walk as galumph, with a distracted and slightly pained expression, as if he'd recently been smacked in the face with a large wet salmon but expected as much: "so it goes." I was so startled to see him that he'd already passed by us before I stopped my dad, saying "Wait a second, I have to do something," and ran after the unsuspecting author. 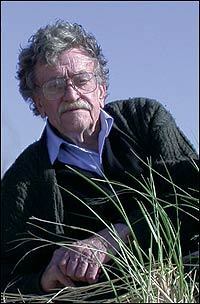 My "Excuse me, Mr. Vonnegut" slowed and turned him round. "I'm sorry to interrupt your day," I said, seeing the baleful look in his watery eyes, and hurriedly asked him if I could get his autograph for a friend of mine. Even as I said it I realized this was the quintessential stock cliche for autograph- seekers -- it's always for someone else -- so I quickly explained that Darcy was a writer who lived in L.A. and that he was her favorite author. This sounded odd to me, too, as if the subtext was "me, I couldn't care less," so although I wasn't about to add, "I love you, too, though my favorite writer is Julio Cortazar," I did blurt something about my being a huge fan of his work as well. Vonnegut had a deadpan that would've done Buster Keaton proud. He considered the request with some gravity for a moment and then nodded. "Got a pen?" Of course. I always carry a pen (you can see by my pen that I am a writer) and I immediately produced it. But it was soon apparent that what neither of us had was anything to write on. I was journal-free, as was he, book and magazine-bare. A quick perusal of my pockets produced nothing but a lone dollar bill. I held it up for consideration, but both of us shook our heads (in a later re-read of Breakfast of Champions, I found his sardonic dismissal of this American currency, with its flying eye-topped pyramid and pretentious Latin he interpreted to mean "In nonsense is strength"). "Hold on," said Kurt, reaching into his wallet, and came out with a dry cleaning slip. He studied it briefly, murmured, "They won't need it," and took my pen. Using a nearby concrete railing for backing, he inscribed 'For Dear Darcy' at the top, and autographed it with a literal flourish -- a sort of sparkling star-like figure adorning the signature. I thanked him profusely, and we parted ways. An ecstatic Darcy Hawes framed the document. And now it can be told: on September 5th, 1995, Kurt Vonnegut had 1 jacket, green ($5.50) and 1 pants, tan ($4.00) at the Turtle Bay Cleaners. They will be ready on Wednesday after 5 P.M. In a Vonnegut novel, the lack of that slip, at the cleaner's on Wednesday, might instigate a chain of events that would end in some darkly funny catastrophe. Or such a slip might serve as the last recorded information about a man subsequently kidnapped by aliens from the planet Tralfamadore. No such luck! in my rom-com story. 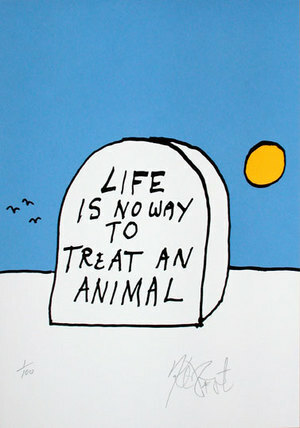 But life's possibilities -- and bless you, Mr. Vonnegut, for demonstrating this -- remain endless. Nice that, for a passage, you channeled him. lovely story. vonnegut was quite hilarious on jon stewart a couple weeks ago. "i'm going to say something nice about george bush. he's not the dumbest person in the white house. [rumsfeld] is."